In this post, my good friend “SF”weighs in on smooth legs, rip off beauty products and more. Thanks SF for this last minute favor! Are you overwhelmed by the skin/hair care aisles wherever you shop? Do you spend far too long in an dazed, eyes-glazed over trance when faced with so many bottles of lotions, creams, gels, washes, toners, scrubs, cleanses….? Do you gasp in horror when looking at your receipt and realize your short shopping list of personal care items costs more than your groceries for the week? Are you expecting me to solve all these dilemmas for you forever? Sorry. No can do. However, I do have one little tip that allows me to skip right over one section of those evil aisles and save a few bucks while I’m at it so this is what I will share with you. Despite what the commercials tell you, you do not need those fancy little bottles and canisters of shaving creams/gels! There, I said it. And this is coming from a former die-hard Skintimate user. One day, mid-shave of course, my Skintimate spit, sputtered, and ran out. Okay, there were many days that it ran out- those things never last long! But there was one day that I was smarter. Instead of using soap, body wash or shampoo as a quick replacement (which I’m guessing many of you might use regularly instead of shaving products already), I used hair conditioner. I loved that it was thick, moisturizing and didn’t suds up, but still rinsed off easily and didn’t clog the razor. Also, my legs had never been smoother! 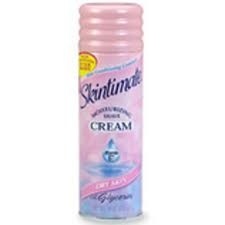 Since that time, I ditched my Skintimate and never looked back. Instead, I now buy large, pump-style bottles of inexpensive conditioner (currently I’m using Aussie Miraculously Smooth). It’s cheap, convenient, lasts forever, and makes my legs feel so, so good! Now, it’s entirely possible that I’m not the genius I think I am and many of you have already discovered this. But if not, you really need to give it try. Your legs, and anyone who touches them, will surely thank you for it! Summer means sundresses, fun shoes, flip flops, days at the beach, water logged hands from the pool, boat rides, soft serve ice cream, potato salad and barbecues. It also means you will face some of your most annoying beauty snafus. Previous week’s sock bun and dry shampoo posts were hits, so I thought I’d go over some other tips to keep you looking fresh in this warm, humid weather. Shave lotion that helps prevent razor bumps! Breaking a Sweat: Spray deodorant is your only defense. That’s right, aerosol deodorant like your Mom had in the 80’s. My Mom was the one who actually showed me this trick! Spray it inside shoes, flip flops or anywhere you’re known to sweat excessively. It’s magic. Blistered Feet From Your Heels/New Shoes: Stretch out those strappy heels. Whenever I have shoes that cut into my feet, I will wear them around with thick athletic socks on to stretch them out. It’s great because it helps to break in your shoes as you stretch them a little bit. Again, magic. Razor Burn: Steal your boyfriend’s after shave. We know we have to shave in some unmentionable spots for bathing suit season. 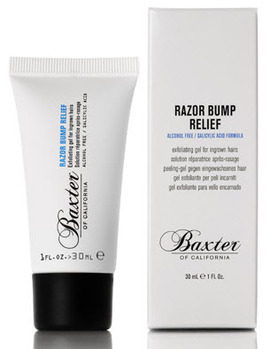 To avoid razor burn, use an after shave soothing gel made for men. My husband uses a brand called Baxter that I enjoy. Smooth Legs: I’ve learned that women’s razors have been holding out on us. Men’s razors usually have more blades and produce a closer shave. You just have to make sure your husband doesn’t mind if you borrow his razor (Mine does). Facials on the Go-Go: I’ve noticed that as long as I have a little St. Ives Apricot scrub in the shower, I can keep my skin looking fresh and smooth especially with all the sweat and grime your face builds up on a hot summer day. Apricot refreshes, the sand smooths and you are able to exfoliate away those rough spots. I like to use it on my feet as well, as it really helps to clean and soften. Protecting Your Skin: When you get out of the shower and do your normal moisturizing, mix your regular lotion with a 30 SPF plus sunscreen. That way no matter where you end up that day, you are protected and only need to reapply. This is helpful to Moms who spend a TON of time applying sunscreen to kids and often forget about themselves. If you have any of your own Summer Beauty Tips, please comment below!